There’s a new minor BackupAssist release today and if you run system protection jobs on Hyper-V host machines, it’s one you’ll want to make sure you download. Following a Microsoft update to Server 2012 R2, some new error messages had been appearing in the job reports. I’m pleased to report that as always, BackupAssist have been quick to respond and within a couple of days we now have this fix. If you haven’t yet upgraded, these are the types of warnings you may see – usually you’d get one of these for each Hyper-V guest you’re backing up. This warning first started appearing when the Microsoft update KB2919355 appeared, and the cause is a Microsoft code change affecting the way that the Hyper-V VSS writer handles its backups. As you may know, starting from Server 2012 R2, the built-in Hyper-V VSS writer automatically performs a Hyper-V checkpoint for each supported guest, during the preparation phase (a checkpoint was formerly known as a Hyper-V snapshot). 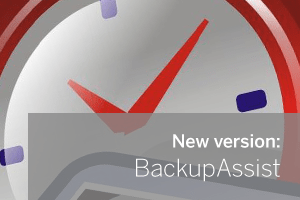 The problem is that after this update has been applied, the naming convention for these checkpoint files is different to what BackupAssist expects. So when BackupAssist proactively queries the VSS writer before the backup and finds that these “unknown” files are missing, it adds the above warning to the report.